Carvel kicks off the summer with new soft serve made with Ghirardelli chocolate sauce. 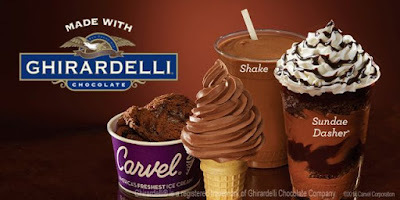 - Hand-Scooped Ice Cream Made with Ghirardelli - Chocolate ice cream blended with Ghirardelli chocolate sauce. - Sundae Dasher Made with Ghirardelli - Soft serve made with Ghirardelli layered with chocolate crunchies and Ghirardelli chocolate sauce, and topped with whipped cream and more Ghirardelli chocolate sauce. - Shake Made with Ghirardelli - Soft serve made with Ghirardelli blended into a shake. - Flying Saucer Made with Ghirardelli - Soft serve made with Ghirardelli served between two chocolate crackers. The new soft serve and featured desserts are available at participating locations through July 31, 2016.